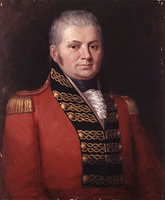 SELBY, PRIDEAUX, army officer, Indian Department official, office holder, and politician; baptized 21 Dec. 1747 in Alnwick, England, son of George Selby and Mary Selby; m. Elizabeth –, and they had at least three children; d. 9 May 1813 in York (Toronto), Upper Canada. On 21 Dec. 1781 Prideaux Selby was made an ensign in the 5th Foot, then garrisoned in Ireland, and he was promoted lieutenant on 28 Feb. 1785. The first reference to his being in North America appears in 1790, when he was stationed at Detroit (Mich.). He had probably come over with his regiment, which arrived at Quebec on 26 July 1787, and in 1790 accompanied it to Detroit, where he is listed as a housekeeper in a report of 1 Aug. 1791. 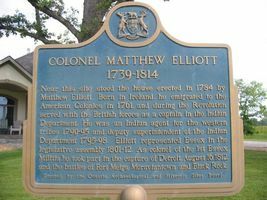 In April 1792 Major John Smith, British commander at Detroit and father of David William*, soon to become surveyor general of Upper Canada, recommended Selby to Lieutenant Governor Simcoe as “a confidential person and competent to give Your Excellency information.” During the election contest of that summer Selby actively supported the candidacy of David William Smith for the House of Assembly, and at about the same time Simcoe appointed him assistant secretary of Indian affairs. Little information is available on the functioning of the Indian Department at this time. However, if Selby’s experience is any example of the rigours of the schedule, the work must have been gruelling and hectic. There appears to have been a great deal of travel involved; his letters for the next few years were often sent to and from a variety of locations. Moreover, there is some indication that he was entrusted with greater responsibilities than one might have expected to find in an assistant secretary. He was apparently quite close to Simcoe and to Alexander McKee*, the deputy superintendent general of Indian affairs after 1794, and periodically was given the general supervision of the department during McKee’s not infrequent illnesses, a practice that continued under McKee’s successor, William Claus*. 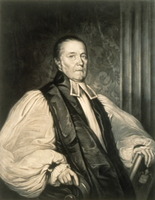 Selby himself had bouts of sickness: in a letter of December 1798 McKee expressed the hope that he would “soon be reestablished in perfect Health, by geting the better of the Cough and Spitting.” Soon afterwards Selby asked for permission to take a leave of absence in Europe because of his health. Peter Russell, the administrator of the province and a man who admired Selby’s “Ability and principle,” forwarded this request to Governor Robert Prescott. As it turned out, with rumours circulating that French and Spanish forces, apparently with Indian assistance, were about to invade British territory by way of the Mississippi valley [see Wabakinine*], Prescott decided that it would be “impolitic” to allow Selby to leave his post. 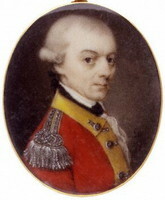 Perhaps because of his ill health, in 1801 Selby received permission from Lieutenant Governor Peter Hunter to conduct his Indian Department business from his home in Amherstburg. The following May he was appointed a justice of the peace in the Western District. Among his concerns at this time was the proper care of his lands, which led to an interest in the cultivation of hemp. Although there is evidence that his magisterial duties and other preoccupations kept him from some of his departmental work, he continued to play an important role in the Indian Department and his opinion was generally sought and respected. Amherstburg at this time seems to have been an efficient post with a good record in Indian affairs, and it might not be unreasonable to assume that Selby was at least partly responsible. Despite his record, or perhaps because of it, Selby was ordered in October 1807 to “remove himself and his office” to York, where he lived the remainder of his life. 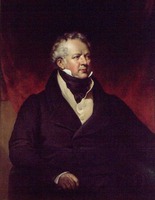 The culmination of his career came on 8 Oct. 1808 when he was sworn in as a member of the Executive Council. On the same date he was made receiver general and on 1 Jan. 1809, as was usually the practice, he also became auditor general, holding both positions until his death. On appointment to the council Selby took the opportunity to apply to Lieutenant Governor Francis Gore* for the grant of a lot in the town of York, which he received a week later, and in his new capacity as auditor general he signed his own receipt for the patent and surveying fees. Conscientious as always, Selby rarely missed a meeting of the Executive Council, and by late 1809 John Askin, a prominent figure in the Western District, could claim that the lieutenant governor “pays great attention to what Mr Selby recommeds.” Nor were his contributions to Upper Canadian life confined to his work in the council. One of the leading members of the Loyal and Patriotic Society of Upper Canada, a benevolent organization established during the War of 1812, he appears to have been the person responsible for proposing the creation of that body: in 1814 John Strachan*, noting that Selby’s “sentiments on most subjects, particularly on public affairs were in unison with mine,” stated that the Loyal and Patriotic Society was “first suggested by Mr Selby, who gave the credit of it to his excellent daughter.” Unfortunately, after reaching the pinnacle of success in Upper Canada and acquiring the land and influence that went with it, Selby became gravely ill in the spring of 1813, ceasing to perform any official duties in April. Close to death during the American occupation of York in late April and early May, he was spared the humiliation of watching the enemy plunder the provincial treasury. On the night before the invasion of 27 April, when Selby was “in a State of insensibility,” Chief Justice Thomas Scott* and William Dummer Powell* paid a hurried visit to his house, where the public money was stored. Acting on instructions from the administrator of the province, Sir Roger Hale Sheaffe*, they told Selby’s daughter Elizabeth to move this money – more than £3,000 – to a safe hiding-place, a task she carried out that very night. A few days later, however, Major William King of the 15th U.S. Infantry demanded the surrender of the funds in the provincial treasury, and this demand was acceded to after a consultation among Scott, Powell, William Allan*, Duncan Cameron*, and John Strachan. Selby died on 9 May 1813 and was survived by his daughter Elizabeth, who, along with Matthew Elliott and Alexander Duff, an inhabitant of Sandwich (Windsor), was a joint devisee in trust of her father’s real estate holdings, which exceeded 2,000 acres. His death undoubtedly deprived Upper Canada of one of its most respected and influential citizens, whose career demonstrated the opportunities offered in the colony to an enterprising young officer. AO, ms 35, letterbook, 1812–34: 96; ms 75 (mfm. at PAC); MU 2100, 1800, no.5; RG 22, ser.155, will of Prideaux Selby. PAC, MG 11, [CO 42] Q, 299, 316–17; MG 19, F1, 5–10; F16; MG 23, HI, 1; 2; RG 1, L1, 22: 481, 523; 25: 141; 26: 88, 98, 151, 401, 412; L3, 447: S misc., 1793–1812/98–100; 448: S1/80, 107, 134; 450: S3/13, 20; 450A: S3/235; 452: S5/115; 454: S9/71; 455: S9/149; RG 5; RG 8, I (C ser. ); RG 10, A1, 1–4, 486; A2, 8–12. PRO, CO 42/349: 202; T 28/3: 229–32 (transcripts at PAC). Corr. of Hon. Peter Russell (Cruikshank and Hunter), vols.2–3. Corr. of Lieut. Governor Simcoe (Cruiksliank). “Grants of crown lands in U. C.,” AO Report, 1929: 99, 138. John Askin papers (Quaife). “U.C. land book C,” AO Report, 1931: 4, 23, 37, 39, 43. Windsor border region (Lajeunesse). Armstrong, Handbook of Upper Canadian chronology. [J.] B. Burke, A genealogical and heraldic history of the landed gentry of Great Britain (12th ed., London, 1914). G.B., WO, Army list, 1782, 1786. The service of British regiments in Canada and North America . . . , comp. C. H. Stewart ([2nd ed. ], Ottawa, 1964). R. S. Allen, A history of the British Indian Department in North America, 1755–1830 (Can., National Hist. Parks and Sites Branch, Manuscript report, no.109, Ottawa, 1971). Horsman, Matthew Elliott. C. W. Humphries, “The capture of York,” The defended border: Upper Canada and the War of 1812 . . . , ed. Morris Zaslow and W. B. Turner (Toronto, 1964), 251–70; “Upper Canada in 1813” (ma thesis, Univ. of Toronto, 1959). C. C. James, Early history of the town of Amherstburg . . . (2nd ed., Amherstburg, Ont., 1909). J. E. Middleton, The municipality of Toronto: a history (3v., Toronto, 1923), 1. J. J. Talman, “William Claus: forgotten loyalist” (paper presented to the annual meeting of the CHA, London, Ont., 1978). H. M. Walker, A history of the Northumberland Fusiliers, 1674–1902 (London, 1919). Alison Ewart and Julia Jarvis, “The personnel of the family compact, 1791–1841,” CHR, 7 (1926): 209–21. Carl Christie, “SELBY, PRIDEAUX,” in Dictionary of Canadian Biography, vol. 5, University of Toronto/Université Laval, 2003–, accessed April 24, 2019, http://www.biographi.ca/en/bio/selby_prideaux_5E.html.